When you see the size of this commercial playground structure and the variety of activities included, you will understand why we named it Goliath! It is an impressive playground that offers 16 adventurous activities for up to 80 children ages 5 to 12 years. It easily becomes the focal point of recreation centers, large parks, and community playgrounds. The first component that children clamor for is the Dueling Criss-Cross Landslide. This slide offers a phenomenally exciting trip to the bottom with two twist and turn choices for kids to experience. 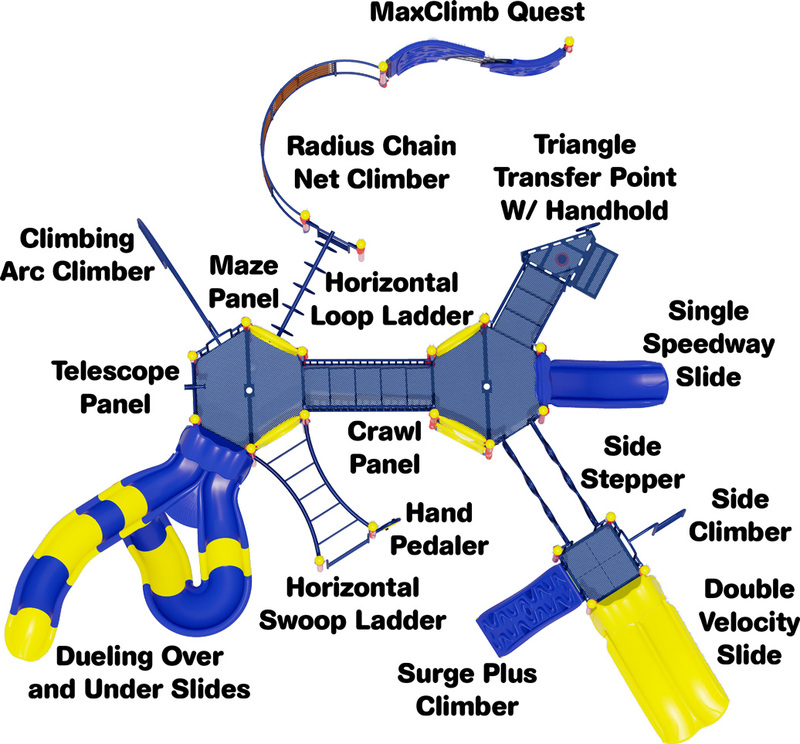 In addition, the structure offers a Dual Velocity Slide and a Single Speedway Slide to explore. Children love to climb and it is a healthy and fun way for them to exercise arms, legs and all muscle groups. The Maxclimb High Quest is a wall with visual and textural appeal that children love to conquer. The Radius Chain Net and Side Stepper offer physically challenging and fun climbing experiences that can be shared with friends. A Dueling Criss-Cross Landslide, Dual Velocity Slide and Single Speedway Slide. A Maxclimb High Quest and Radius Chain Net to test wall climbing skills. Two Crawl Thru components (ground level). An educational Moon Phase Panel and fun Bubble Panel for outdoor learning. A Horizontal Loop Ladder, Side Climber and challenging Climbing Arc. A Horizontal Ladder and Surge Climbing Attachment. The exciting Side Stepper (which links two upper decks). A 15 year limited warranty on decks and plastic components. UV stabilized and rotationally molded plastic parts for safety and durability. Steel decks constructed with safe, non-toxic lead-free polyethylene coating. 12 gauge galvanized aluminum posts are 3.5 in diameter and backed by a lifetime warranty. Metal pipes, rungs, loops, and rails come with a 50 year limited warranty. ADA Accessible via transfer station with handhold for mobility-impaired children. American Parks Company is a recognized natural brand leader in quality commercial playground structures for schools, HOA and residential communities and other organizations. We also provide convenient playground bundles including surfacing, shipment and installation to help you quickly source your complete playground needs. 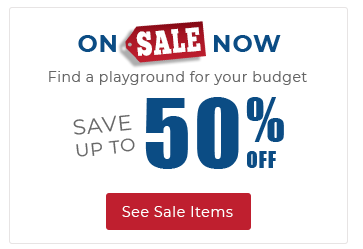 Call us at 1-800-381-4491 and get assistance from one of our qualified playground experts, and ask us about customizing your commercial playground with over one hundred different color options. 5 Slides, 8 Climbers, Moon Phase Panel, and Much More!